For the disease, see Dengue fever. In the late 1990s, keyboardist Ethan Holtzman discovered Cambodian psychedelic rock music while traveling in that country. Coincidentally, his guitarist brother Zac Holtzman (then with the band Dieselhed) had discovered the same music while working at a record store. 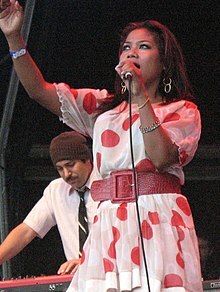 The brothers formed Dengue Fever in 2001 to perform covers of songs by Cambodian artists like Sinn Sisamouth, Ros Serey Sothea, Pen Ran, and others. The band first recruited bassist Senon Williams (also a member of Radar Bros. until 2009), former Beck saxophonist/flutist David Rallicke, and drummer Paul Smith. The band then decided to add a vocalist who could sing the Khmer lyrics of the Cambodian songs they hoped to play, and auditioned singers in the Little Phnom Penh area of Long Beach. The band selected Chhom Nimol, who had previously been a well-known singer in Cambodia before emigrating to the United States. Their self-titled debut album was released in 2003. The album consisted mostly of covers of 1960s-70s Cambodian rock songs discovered by the Holtzman brothers, plus two original songs in the same style. Nimol sang all lyrics in Khmer. The band's later albums are mostly made up of originals, first written in English by the Holtzmans before being translated; while Nimol still usually sings in Khmer but occasionally in English as well. Their second album Escape from Dragon House was released in 2005. The album was one of Amazon.com's Top 100 Editor's Picks of 2005. Also in 2005, the band toured Cambodia during the Bon Om Thook water festival, to critical acclaim. The 2009 documentary film Sleepwalking Through the Mekong by producer John Pirozzi documents the tour, with coverage of concert performances, collaborations with master musicians, and Chhom Nimol's success in reconnecting with Cambodian fans who had not seen her perform in person for five years. The documentary finds that the 1960s-70s Cambodian rock music played by the band was still very popular in that country, and fans were interested in seeing a mostly-American band perform the songs. John Pirozzi, also a fan of that music, later produced the documentary film Don't Think I've Forgotten with involvement from some of the members of Dengue Fever. In 2008, Real World Records released Venus On Earth in all territories outside of the U.S. and Canada. Peter Gabriel, founder of their new label, said of the deal, "We have Dengue Fever coming out on Real World Records (outside of the USA) - it’s really cool stuff, with the small Cambodian singer and big American guys behind! They’re California based but have taken 60’s Cambodian pop as their main source of inspiration and it’s done with a lot of style. It’s spirited, impassioned stuff." Venus On Earth was selected as one of the best world music records of 2008 by the iTunes Store. The album won the award for Best Fusion Album at the 2009 Independent Music Awards. In 2011 the band released the album Cannibal Courtship, which was noted for incorporating more world music elements beyond the band's well-known Cambodian influences. Their fifth full-length album, The Deepest Lake, was released in 2015 and was noted for expanding the band's sound even further into girl group pop, surf music, jazz, African rhythms, and other styles while retaining its roots in Cambodian psychedelic rock. In 2017, Dengue Fever embarked on their longest-ever American tour as the support act for Tinariwen. Dengue Fever has entered into partnerships with a number of charitable organizations to support causes in Cambodia. As one example, they are involved with the wildlife and forest conservation organization Wildlife Alliance. The band compiled an album of original 1960s-70s Cambodian rock songs titled Electric Cambodia in 2010, with all proceeds donated to Cambodian Living Arts, an organization that seeks to preserve the traditional and popular Cambodian music that was nearly lost during the country's recent historical struggles. The band has also donated songs for benefit records produced by Sweet Relief Musicians Fund, a charity that provides financial assistance to musicians dealing with illness, disability, or age-related issues. "Ethanopium", a cover of a song by Ethiopian jazz musician Mulatu Astatke, was included in the soundtrack of Jim Jarmusch's 2005 film Broken Flowers. "One Thousand Tears of a Tarantula" was included on the soundtrack for the second-season finale of the Showtime series Weeds, as well as on the recap of that episode for the third season. The band's Khmer cover of Joni Mitchell's "Both Sides Now" was included on the soundtrack of Matt Dillon's 2002 film set in Cambodia, City of Ghosts. "Seeing Hands" was used as the theme tune to the 2008 UK television series Sanchez Get High. "Escape From Dragon House" was featured in the fourth episode of True Blood. "Sni Bong" was used for the weather section of Episode 21 of the podcast Welcome to Night Vale. "Integratron" (named after the Integratron; often misspelled "Integration") was used in a sketch of Saturday Night Live Korea that parodies the video game franchise Grand Theft Auto. "New Year's Eve" was used for a bwin commercial in German television. In the play Cambodian Rock Band, by Lauren Yee, the actors play and sing several Dengue Fever songs: "Uku," "Family Business," "One Thousand Tears of a Tarantula," "Cement Slippers," "Sni Bong," and "Tooth and Nail." ^ Huey, Steve. "Dengue Fever". AllMusic. Retrieved October 23, 2016. ^ "Psychedelic Cambodian surf band Dengue Fever to visit Bay". San Francisco Chronicle. February 4, 2015. Retrieved October 23, 2016. ^ Smith, RJ (January 22, 2008). "Dengue Fever: Los Angeles Band Mixes Cambodian Pop and American Indie Rock". New York Times. Retrieved 1 February 2018. ^ "Dengue Fever: Retro Pop, Cambodian Style". NPR. January 25, 2015. Retrieved 1 February 2018. ^ Warner, Brad (2008-03-17). "Interviews > Dengue Fever's Ethan Holtzman". Suicidegirls.com. Archived from the original on 2011-06-29. Retrieved 2011-08-12. ^ Gilstrap, Peter (January 14, 2015). "Cambodian Rockers Dengue Fever Celebrate Their Singer's U.S. Citizenship". LA Weekly. Retrieved 1 February 2018. ^ "Dengue Fever (2003) album". AllMusic. 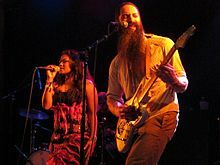 ^ "Dengue Fever: Artist Biography". Retrieved 1 February 2018. ^ Denselow, Robin (June 11, 2009). "Dengue Fever: Sleepwalking Through the Mekong". The Guardian. Retrieved 1 February 2018. ^ Sisario, Ben (9 April 2015). "'Don't Think I've Forgotten,' a Documentary, Revives Cambodia's Silenced Sounds". New York Times. ^ "Peter Gabriel Catches Dengue Fever". Anti-Music. June 12, 2008. Retrieved 1 February 2018. ^ "Winners of the 8th Annual IMAs Announced". Independent Music Awards. August 4, 2009. Retrieved 1 February 2018. ^ Lusk, John (2011). "Dengue Fever: Cannibal Courtship Review". BBC. Retrieved 1 February 2018. ^ Capobianco, Ken (January 27, 2015). "Dengue Fever, 'The Deepest Lake'". Boston Globe. Retrieved 1 February 2018. ^ Arsenault, Dakota (April 18, 2017). "Tinariwen with Dengue Fever at Massey Hall". Live in Limbo. Retrieved 1 February 2018. ^ Jenkins, Mark (June 9, 2011). "Dengue Fever: Turning up the heat at Black Cat". Washington Post. Retrieved August 5, 2011. ^ "Dengue Fever Presents :: Electric Cambodia (A Compilation)". Aquarium Drunkard. Retrieved 2011-08-12. ^ "Music Review: Dengue Fever Presents Electric Cambodia - Blogcritics Music". Blogcritics.org. Retrieved 2011-08-12. ^ Mageean, Sean (March 11, 2015). "Dengue Fever Takes the Plunge". Santa Barbara Independent. Retrieved 1 February 2018. ^ "iTunes - Music - Venus on Earth (Deluxe Edition) by Dengue Fever". Retrieved 2014-11-23. ^ "Dengue Fever Integration 1hour - YouTube". Retrieved 2014-11-23. ^ "구남과여라이딩스텔라(goonam)+뎅기피버(Dengue Fever), Integration@상상마당라이브홀 20141123". Retrieved 2014-11-23. 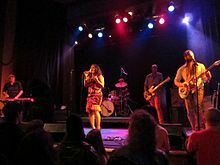 Wikimedia Commons has media related to Dengue Fever (band). This page was last edited on 25 October 2018, at 17:38 (UTC).